Last year pixelache festival started using a new venue, an exhibition container located on the Kiasma square in front of the museum. 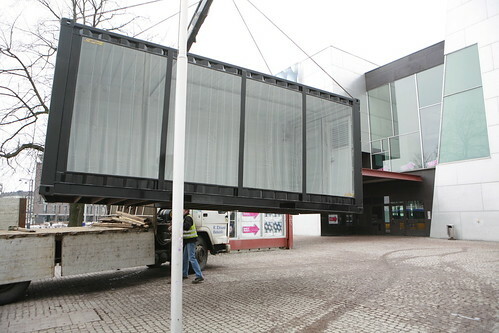 Container is the kind of middle ground between activities inside the museum and those happening in the cityscape. This year the container will be used for the “Art and sustainability” program-section. Container will be filled with a self-sustainable party. It is a joint venture between association of experimental electronics from Helsinki, MIM-project from Estonia and participants of the Art and sustainability workshop. We will build an interactive installation with sound and light using only energy produced or harvested on site. Container will be operating 24h, we will have 3 guided party-slots when our grew will be demonstrating the full potential of the container. Container will be operational from wed 24.3 19.00 till su 28.3 17.00 We will have some special partyslots on: wed 19-20 thu 19-20 sat 19-20 On other times feel free to party around the container yourself.